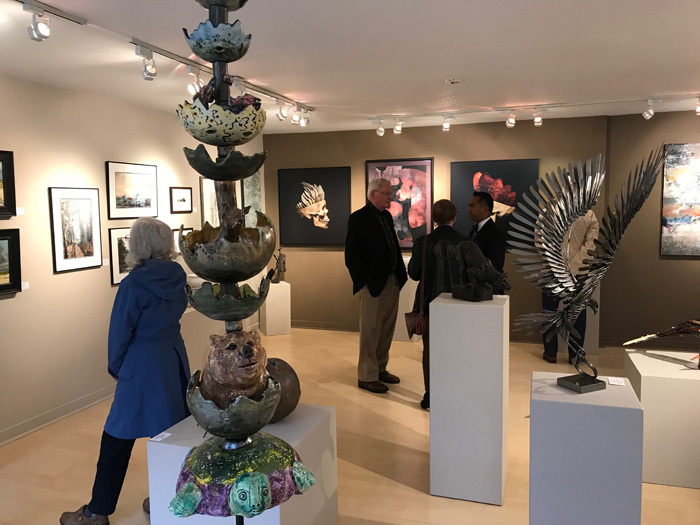 Opening night of Symbolically 8 show at Gallery 8 on Friday, with Spirit Totem sculpture by Karen Reiss and Goshawk XVII by Carl Sean McMahon seen in foreground. There was no merit to the curse of Friday the 13th for art lovers this past weekend, as four gallery openings pulled out the crowds despite the all-too-real April showers. With all events kicking off at 5 p.m., members of the public had their choice of where to start and how to use their time to best effect. Some will no doubt go back for a second look when the crowds aren’t so dense, but the weekend was the only chance to catch the travelling Steamroller Prints show that Duthie Gallery brought to Mahon Hall. The hall proved a magnificent setting for the huge 4-by 8-foot vertical banners, printed via woodblock carving. The huge scale meant the carvings had to be pressed onto paper with help of a steamroller, and also produced a limited colour range. Most were done in black ink with just small areas highlighted in red, although a few also had small bits of yellow and blue. Incredibly, the process for adding the extra colours to such big prints involved jig-sawing out the pieces that were to have colour, inking them, and then re-inserting them into the main block before the single pressing. Rausenberg, who is also executive director of the Eastside Culture Crawl Society, explained the projects came out of C3’s mandate to facilitate collaboration in its community, which is the Downtown Eastside. Some of the prints at Mahon Hall came about through a project that brought together First Nations and Chinese-heritage artists in the area. Another saw a partnership with the Coastal Jazz and Blues Society, and therefore had a musical instrument theme. The black, white and red combo lends itself to bold graphic design, which was seized by the artists involved. Personal favourites for me included Jeanette Lee’s exploration of the ginger root as central to Chinese cooking and medicine in To Your Health, Jerry Whitehead and Gerald Pedros’ Go With the Flow and the marvellously whimsical rabbit playing stand-up bass for a rose/singer by Mariko Ando. April is always an exciting time for Gallery 8, as owner Razali May celebrates the space’s anniversary with a show featuring all gallery artists. Though many of them used to observe the lucky “eight” theme, these days it’s more about sharing a glimpse into new work that is particularly important to them. Daniel Tibbits has been a gallery mainstay for many years and is known for his surreal paintings of stone whales and cloud cities. This time around he shows an entirely different side, which he began exploring by accident after seeing a chance arrangement of wooden blocks. Tibbits’ high gloss photos are printed onto aluminum, and tell a condensed version of a larger book project he is working on based on a robot character and his post-industrial world. The lonely figure collects scraps of paper with words and brings them back home to weigh; the goal is for the positive to balance out the negative. The character and his set, both constructed from stained wood blocks, appear life-sized in the photos but actually fit on an oversized table in Tibbits’ studio. With his background in film, Tibbits has created marvelous lighting that suggests a moonlit scene and mysterious golden light on his figure, while the unframed photos have an immediacy that draws the viewer in. Another set of intriguing photos comes from David Joseph Ellingsen and his Anthropocene Series. The two on view feature a human skull in profile with the top sawed off and set with a collection of exoskeletal materials: a crown of red crab shells in one, and a jagged headdress of softly tinted sand dollars in another. Both are visually striking and thought provoking. Shoshana Walfish brings a classic painter’s approach to her oil on linen still lifes. Salt Spring Lemons contrasts two glowing fruit and a brass vase against cool grey background and mint green counter, offset perfectly by the wide black frame edged in silver. A scene of apples has a looser feel, with a line of yellow and red fruit across a middle foreground hit with the light, and soft darkness behind. Sculptural works that make a strong impression include Sean Goddard’s The Nest Maker, with glossy metal beetle at work rolling a patinaed copper ball of material. Janis Woode captures the deft sense of character she often imbues into her wrapped wire human figures in a surprising way, making The Visitor perhaps the only rat one would be happy to see. Printmaking is the medium currently in focus at Fault Line Projects, with a group show that brings together names from Salt Spring and Vancouver. This is one of those rare chances to see works by LeRoy Jensen and Gabrielle Jensen together, as well as prints by gallery partner Amy Jones. Former islander Bruce Cobanli is also featured, with abstract black ink works that speak to his dual, and perhaps inseparable, loves for both visual art and music. Cobanli is living in Victoria these days but knows gallery co-owner Nigel Harrison from when they were both in London during the mid 1980s. Harrison was working at the renowned contemporary art venue Hayward Gallery; Cobanli got in the door as a security guard, but was inspired to embark on his career in the arts. His current pieces show both strength and sensitivity, with fluid marks and delicate shadowing. Vancouver artist and longtime Langara professor Gordon Trick is clearly a master of the print form, and his work is especially powerful seen in collection. Screen-printed photo transfers, drawing and etching combine for evocative imagery, printed onto steel. The North Arm series features large colour fields based on water and or/sky in moss green, blush pink or a shift from blue to jade. In each piece, a negative image in black and white on the right side brings a darkly textured contrast to the main serene expanse. A guest show at Salt Spring Gallery will be many people’s introduction to Norma Hoeppner, an artist who has a huge range of styles and interests. Although she graduated with a fine arts degree with a major in print-making, the show has many more samples of her abilities with watercolour brush, pen and pastels. Bright colours and a slightly skewed perspective are features of much of her work, which also has elements of humour and whimsy. It’s tough to single out examples with so many pieces on exhibit, but some that spoke to me include a delightful portrait of a woman with red-framed cat’s eye glasses and a crown of flowers over a long, thin head and face, and the seemingly hard-thinking dog just below that — also set as head and shoulders portrait style, with hot pink background. Village is a lovely scene in shades of violet and blue, with a jumble of houses and town houses with peaked roofs and the odd cheerfully lit window at night. A lone black animal is out to enjoy the evening air.